Use a keyword tool to help identify keywords for your article titles. Start your article title with your article subject. Avoid starting with “junk words” such as “a” or “the” or conjunctions. It’s okay to start your title with a verb and then roll directly into a dense keyword phrase relating to the subject of your article. Consider using two article topic hooks in your article title. As always, the best way to learn a new skill is to practice, practice, practice. So start using these tips TODAY to help you write article titles that are enticing, accurate and, most of all, effective. Leave a comment with your tips and techniques for writing awesome article titles. I confess… I have not been considering keywords nor keyword phrases that much as I try to meet the 100 Articles in 100 Days Ezine Article Challenge. Waa! I KNOW how important that is, so I really have to get back to that. It makes such a huge difference in reads. Well, I figure one step at a time, this is the first time I have honestly applied myself toward wring so many articles, in such a short time frame. Pats on the back at least for that. OK.. gotta run.. I just thought of an idea for today’s article! I hope your doing well with your writing. Everyone needs to use key words – very powerful. In my estimation, Henry is correct. I loved how you kept building on the title, until there was mystery and desire pulling me in. Both the 3rd and 4th titles hooked me. If I were interested in Subwoofers, I would have read the articles. I have learned that many people will write a hundred titles, before choosing the one they think readers will click on. That’s how important titles are. And keyword rich titles gets you found on the search engines. That’s how important it is to use them. I’m just learning and practicing on how to add that essence of mystery to a title (the hook.) Thank you for the suggestions. I totally disagree for several reasons! First, approximately 76% of my top article titles are‚¬€ how to titles. Note: check my author bio for proof! Second, placing keywords in the front of your article title with a dash does not mean your article will appear higher in the search engine results. Note: search engine algorithms score web pages by relevancy as a whole- and not just by the article title alone. Third, article titles with dashes distract readers from digesting the benefits of the article because of the short pause break. Article marketing ‚¬€ 7 ways to so and so! Article marketing ‚¬€ 7 ways to energize so and so! Article marketing ‚¬€ 7 ways to maximize so and so! When you see rows of article titles like this, do you feel inspired? Now what would the car audio titles sound like if we focused on quality unique content for our readers instead of focusing primarily on search engine rankings? As you can clearly see, the article titles sound much better and the keywords are still located in a key position to attract the search engine spiders. No disrespect to Marc, I just see to many authors focusing on SEO tactics instead of providing interesting unique content that has value. Not to mention, when you submit articles to a site that generates over 16 million unique visitors each month, it’s pretty easy to generate traffic to your website if you consistently add several new articles to ezines database each month! I myself am new at this internet business and I have quickly developed a serious interest the challenges of copywriting. The keywords are HUGH. I know I have made it harder than it should be. I find myself over analyzing and it produces a tendency to paralyze my progress because it doesn’t look perfect. So I decided I would jump right in and give it a college try. So thank you for the comments! Indeed, it is amazing how great “well-titled” articles pull online, I could not agree more. Absolutely right. Thanks for your input, I agree wholeheartedly. And your suggestions for other titles are right on the money. For the sake of clarity, the article titles I used as examples were not based on SEO tactics but on the smart use of keywords alone. The fact that the final example has a dash in it was purely coincidental and not a contrivance of SEO. Very informative posting with lots of usable information. I’ve never thought of “stop” words as being junk. Keeping in mind that it seems that, for most purposes search engines ignore stop words, do you still recommend avoiding them? PS: If / when you start automating keywords (which I’m all for) I take it that we’ll still have to find our own keywords? Will it matter to your system where they come from? Or am I talking out of my hat? Any tool that scrapes to predict what you should do is not as good as a tool that uses what users ALREADY used to find the right keywords. Note: We ban & terminate members who scrape us…as we perceive the behavior as an attack regardless as to intent. I can see that this keyword field is highly misunderstood by many members and that this blog entry has shown me that LESS communication may be better than confusing more people with more communication about it? Or perhaps I did a poor job of showing specifically what I’m talking about. Notice how the authors included KEYWORDS didn’t even closely match the most used keywords in the article? One could argue that is an “inefficiency” that automated keyword selection would handle not just more efficiently, but more precisely. The reason it means nothing to me personally what other people use as keywords in their articles, is that first off I would have to know that they are getting A LOT of reads to cause me to wonder about it in the first place. Gads that would take a lot of time. I have looked and it becomes a tedious waste of time that could be spent writing my own stuff. To be honest I do look at sources within my particular niches on top sites on Google, but past that, I think it would inhibit me significantly to make a habit of pulling keywords from someone else. I did a keyword study that took me weeks that was within my niches and find myself continually going back to it. It continues to work. Every time I stray from them I get less reads and perhaps even less inspiration, which is strange because it is redundant at times. With the 100 articles with 100 days Challenge I have strayed from my keywords in my efforts to get them out and just think now.. what is that point?! Go back to what was working for ME. I’m just now reading this blog and you gave me some good ideas for titles for an article I am going to start writing. All this article marketing and other forms of advertising boil down to the same thing…grab the readers attention, give them valuable information according to the keyword and encourage them to take what you have to offer! Give people what they want. The keyword is your hungry crowd searching for a resolution…everything else will fall into place. 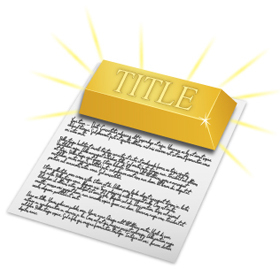 Picking a title does make it easier to write the article and that is based off of your keyword, which is your topic of conversation or the problem that needs to be resolved. I’m a little late…I know. I think I should write an article on: Magnet Therapy or Magnetic Therapy – which is best key word. * My daily Google results. * undesirable results with magnet and magnetic alone. * My opinion on proper usage. Thank you – I have always struggled over the title of an article. This was very helpful.